Sika deer were initially found in southern Siberia and the Japanese island of Hokkaido in the north along both mainland and island chains to southwestern China and Taiwan. They were located by western zoologists in the middle of the 19th century, when they found many (more than 70) subspecies, especially in the Asian continent. The Chinese chemists bred and cross-bred sika for centuries and used virtually every part of the animal. In Japan, however, herds ran free throughout the country. Those in the north had large body and antler size, while those in the southern region were smaller. The first sika were introduced in America to Maryland in 1916, and into Texas in 1939. Sika deer tend to range in color from mahogany to black. They are rarely white with very few documented cases of white as opposed to albino. All colors carry a distinctive black dorsal stripe from the base of the skull to the tail. Most animals have some degree of spotting with the mahogany color generally carrying white spots and the darker colors having either white or black spots or black flecking. When alarmed, they will often display a distinctive flared rump much like the American elk. All sika are compact and dainty-legged with short, trim, wedge-shaped head and a boisterous disposition. Sika stags have stout, upright antlers with an extra buttress up from the brow tine and a very thick wall. A forward-facing intermediate tine breaks the line to the top, which is usually forked. Occasionally, sika develop some palmation. Females carry a pair of distinctive black bumps on the forehead. Antler length can range from 11 to 19 inches to better than 30 inches depending on the species. Stags also sport a distinctive mane while in the rut. The average weight for an adult stag is 160-220 pounds. Sika are study animals and seem to do well in the north as well as the hot, dry southwest. 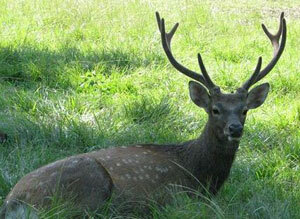 Sika deer have a calm disposition, however, they are prone to biting when put in a trying situation. Sika deer respond well to palletized feeds, corn, hay, and do well foraging on their own in a free range situation. However, water is extremely important and providing an area for wallowing and splashing is a must. In the wild, sika prefer forest type vegetation and feed primarily at night. They are true ruminants and feed on plants, grasses, leaves, bark and off the ground. Like their red deer cousins, sika deer are susceptible to stress-related disease if poorly managed. Sika deer have seasonal synchronization of birth, body, growth, activity cycles and growth stasis to correspond to feed quantity, quality and availability. For example, maximum nutritional demands for females occurs during lactation. The precise timing of breeding and birthing insures that maximal lactational demands coincide with the most lush and plentiful growth of forage (May, June, and July). The summer is the time of fawning and lactation, and the time of maximum weight gain for the yearlings. For the mature stags, it is the time for antler growth and regaining of body condition and fat reserves which were depleted during the previous autumn rut and winter. For sika deer, birthing usually occurs between May and August, with a gestation period from 222-262 days. Twinning is rare in sika deer. The sika rut is often referred to as the "roar". The rut generally starts in middle to late September with hinds beginning to cooperate in early October to as late as December. Stags must be separated during the roar as they become intolerant of each other and will cause great harm to other nearby males. One stag will service 15-20 hinds.